Puppies begin police dog training in new program. Officer Natalie Bauer and Cirrus work together on a command. Cirrus and Bauer live together full-time, as does each officer-K9 pair in the department. Though playful now, the pups are in a program to learn all the skills they’ll need during their career. Patrol Sergeant Jason Posel explains, “The dogs learn how to track, search buildings and vehicles, search for evidence, learn obedience, and are trained in criminal apprehension,” he says, adding that a separate four-week training program is used to teach dogs to sniff out narcotics. Training runs full-time for 13 weeks, and once dogs complete the program, they will work for six to eight years, on average, before they retire. Most police dogs start training in their local force at around 1 year of age, but Woodbury’s Police Department has started a novel program called Canine Cadets that uses a different tactic. Instead of importing a dog from another country, Canine Cadets uses locally bred dogs that can start training earlier. “Since we do a lot of tracking and search work with our dogs, we wanted to work with younger dogs and put meaning to scent during their early developmental stages when they are forming associations,” says Posel. Beginning this foundational training at an earlier stage also allows the department to train “the next generation of handlers,” providing more experience in developing the puppies’ tracking, socialization and other abilities. Nailing these skills early on is important for a dog’s professional development, as their primary tool is their nose. “Police dogs can sniff out evidence, track for missing children or vulnerable adults, sniff out illegal narcotics, and find suspects hiding in the community,” says Posel. Of course, police dogs are not only tasked with searching and tracking—they're also exceptional at community outreach. Especially when they’re puppies. “People enjoy learning about our dogs and the program,” says Posel. “We bring our dogs into our schools to meet students, we conduct dozens of public demonstrations throughout the year, and we involve them in community outreach events.” Posel joined the police force in 1998, and describes his own influential childhood experience. “A police officer and their K9 visited my fifth-grade class for a meet-and-greet. 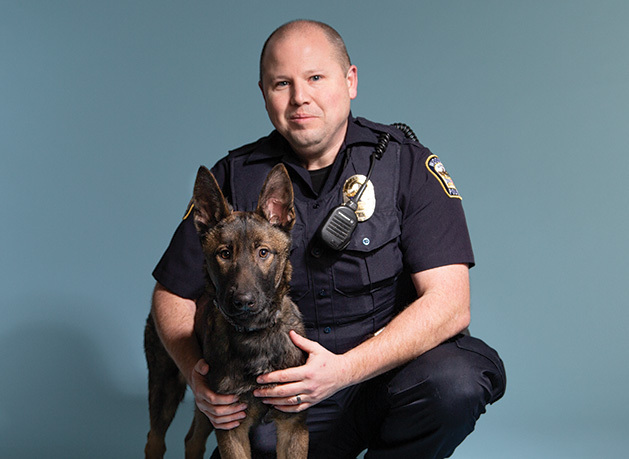 It impacted the way I viewed police, my community, and got me excited to be a police officer and work with dogs.” He hopes that the K9 Fund will continue to support the police department and community well into the future. It might even inspire some future police dog handlers along the way. The Woodbury Police K9 Fund was started by Donna Stafford in memory of her husband Bruce, a career firefighter and paramedic. The fund depends on the support of its community and volunteers. To learn more, visit the fund’s website or Facebook page.